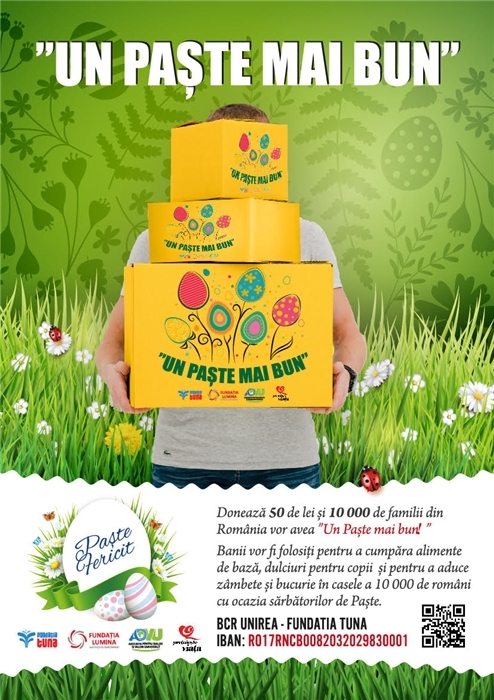 ISB is supporting Lumina and Tuna Foundation Easter Charity Campaign “Un Paste mai bun” which will run until 28th April 2019. The purpose of this campaign is to offer basic food supplies and sweets in the amount of 50 lei/family to 10,000 families in Bucharest, Ilfov, Giurgiu, Constanța, Cluj-Napoca, Iași, Oradea, Ploiești. Alternatively, you may donate at school directly. There is a charity box placed in the gallery. How would the packages be shared? We will share the packages as follows: In Bucharest and Ilfov - 5500 packages and in Giurgiu, Constanța, Cluj-Napoca, Iași, Oradea, Ploiești we will share 750 packages to each city. Let’s come together to help the less fortunate communities in Romania to have a Happy Easter. Thank you very much for your generosity. Please find below further information on the organisations involved in this charity campaign.